Is Technology Driving Us Apart? Maybe Not – Media! Tech! Parenting! These days we have so much debate about whether or not digital devices are decreasing our face-to-face communication and our quality of life. If you are interested in this debate, check out a fascinating January 17, 2014 article in the New York Times Magazine. 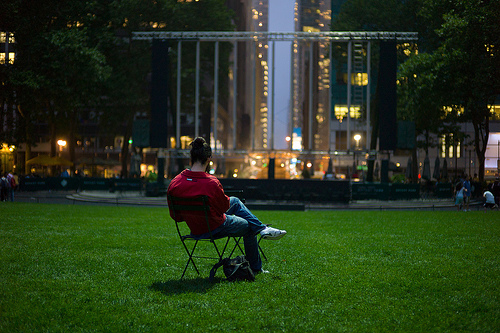 In Technology Is Not Driving Us Apart, writer Mark Oppenheimer describes how Rutgers University Professor Keith Hampton and his associates filmed the human interactions at Bryant Park — a New York City park just behind the New York Public Library — to discover how people interact in public spaces. In the process, researchers wanted to learn more about how today’s digital devices affect those interactions. Professor Hampton based his work on the research of William H. Whyte, a sociologist who filmed people interacting in urban public spaces to learn more about their behavior and what they do. Whyte did his filming in the late 1960s and 1970s, calling it the Street Life Project. Studying the films, Whyte tried to discern what people liked to do, how they conversed, how long those conversations lasted and in what locations. Hampton found that, rather than isolating people, technology made them more connected. “It turns out the wired folk — they recognized like three times as many of their neighbors when asked,” Hampton said. Not only that, he said, they spoke with neighbors on the phone five times as often and attended more community events. So Professor Hampton, after studying Whyte’s old films, which happened to be archived in a warehouse, wondered whether new filming years later in some of the same locations might yield interesting data about the way people interact today and how digital devices affect their face-to-face socializing compared and contrasted with the older Whyte films. Professor Hampton’s data suggest that in public places, at least, people are still interacting with one another. This is a fascinating article and well worth the time it takes to read, though the article is lengthy. What the article and Professor Hampton’s research do not address is the changing interaction between family members. Each time I see a parent on the phone while walking along with a child or pushing a stroller, I regard them with a somber kind of wistfulness. Living life with a small child was arduous more often than not, but I have fond memories of walking along with my daughter and chattering about the blue sky, the color of leaves, the trucks, the backhoes, other people passing by, and so much more. What I remember most, I think, is the way she looked right at me watching me talk. I also remember meeting other mothers, chatting with them and then breaking off to refocus on a child when he or she made a sound or tried to say a word. On my daily walks I don’t see much of this now — everyone is on the phone. On the other hand, every day I am in conversations with people, often my students in grades five or older, and a topic comes up raising questions that we cannot answer. Inevitably one of us reaches for the nearest digital device to find answers and then shares for the answer. Sometimes it’s a bit of a competition as more than one of us searches. Inevitably, though, one or two of us come up with pertinent information, we share it, and then go on with our conversation. This delights me each time it happens. I’ve read Professor Sherry Turkle’s Alone Together, and I agree that because of our dependence on digital devices, we need to consider more carefully the ways we interact with one another face-to-face. The lack of parental focus that Catherine Steiner Adair writes about in The Big Disconnect (currently the featured book on this blog) is a big concern for families and schools. I observe this disconnect on a daily basis and I, too, am guilty of disconnecting at times. As an educator and a parent, I take the messages of these two books to heart. I wonder, however, could Professor Hampton’s data be giving us a glimmer of a world where we are indeed beginning to incorporate digital activities into our lives with greater attention to the people around us? Are we finally learning how to manage and moderate the digital devices — viewing them as necessary accoutrements but combining them with hardy and meaningful face-to-face interaction? Are we beginning to “get-it” when it comes to the significant role that interactive and thoughtful conversation plays in our lives and in the intellectual growth of our children? Read Technology Is Not Driving Us Apart and see what you think.